DIS, Vienna 24th April 2013 � Panasonic has today launched its newest DSLM (Digital Single Lens Mirrorless) camera, the LUMIX DMC-G6, offering a 16.05M Live MOS Sensor, the advanced process noise reduction systems and a 'Low Light AF' function enabling serious photographers to take the quality of their pictures even further regardless of low-light situations. The new powerful Venus Engine coupled with the LUMIX DMC-G6's 16.05M Live MOS Sensor enable users to demonstrate the true image quality achievable with a DSLM camera. Furthermore the camera has an improved ISO range from 160 ISO all the way up to 25,600 ISO (extended) allowing photographs to be captured in spite of very little light in some environments. Boasting a high speed AF system, 'Accurate AF' and 'Low Light AF' for shooting in low-light conditions, you'll never miss the perfect moment with the LUMIX DMC-G6. A wide range of AF modes are available, including multiple-area AF, Face Detection, and AF Tracking resulting in the LUMIX DMC-G6 being able to lock onto any subject and keep it in focus even if it moves. Additionally, the LUMIX DMC-G6's rapid burst shooting capability - at seven Frames per Second (FPS) in full resolution, can capture multiple shots of fast-moving subjects with stunning clarity. The quality advances of the LUMIX DMC-G6 are not restricted to still images. A 24p video mode has been added enabling users to capture moving images and play them back with a dedicated 'film like' appearance. The sensor and Venus Engine enable the camera to record in Full HD 1080/50p, with stereo sound, producing professional movie quality with minimal noise. 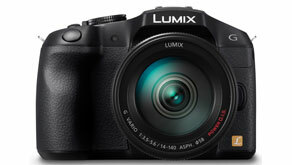 With outputs in both AVCHD progressive and MP4, the LUMIX DMC-G6 provides wide compression and compatibility options. The long recording times, instant access controls, advanced AF system and LUMIX G lenses specifically designed for movie shooting, means the LUMIX DMC-G6 is the perfect option for capturing beautiful movies with ease. With a choice of using either the Electronic Viewfinder (EVF) with eye sensor, or the high resolution, 3.0-inch free-angle monitor to compose your shots and movies, you can capture the moment as the situation demands. Meanwhile, the revolutionary touch control shooting - including full-area touch focusing where the focus can be set immediately to the subject, or to the background, by just one touch of the large monitor even when using the EVF � gives you the control to compose and create stunning images.